Back with another instalment of my "Can you CASE it" series. This time I've CASE'D (Copy and Share Everything) a card from page 166 of the Annual Stampin' Up! Catalogue. Do you love to colour? I do. There's something very relaxing about it - even though these days I find I need to put my glasses on to see :( The Just Add Color Specialty Designer Series Paper (Item 144155) is perfect if you love to colour. The images are whimsical and easy to colour. 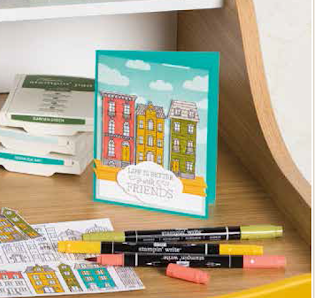 The card features the house paper and I love the bright colours that are featured. It reminds me of San Francisco with the row of brightly coloured houses. The architecture also reminds me of the houses along the canals in Amsterdam. I stayed true to the catalogue picture and used the new Embossing Paste to create textured clouds in the background! Would you like to receive the full instructions for this fancy fold card? It's part of the Thank You set of cards that include the full instructions that you can receive with a $50 Online order that uses the August Host Code KT44WUWU. You can use your Bonus Days coupons toward the purchase of any of these supplies! If you need any stamping supplies, I’d love to be your Demonstrator. 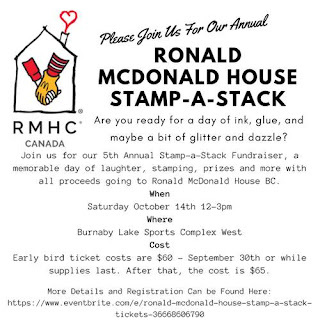 If you're on my blog, just click on the Order Stampin’ Up! Online Now button on the right side of the screen to go directly to my online store, or click here or drop me an email if you have any questions. 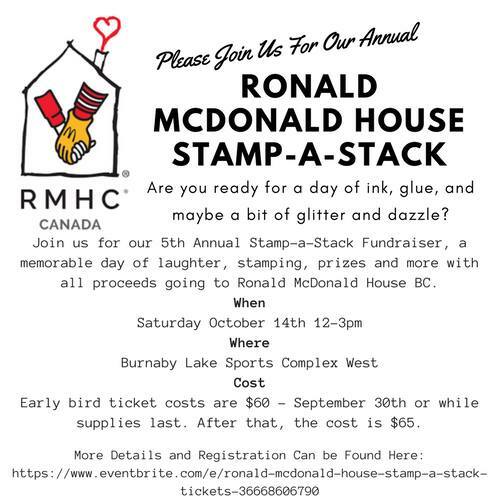 I'm so excited to announce our 5th Annual Ronald McDonald Stamp-a-Stack event on October 14, 2017. If you're interested, you can register at the following site! We are looking forward to a wonderful day and to raising money for such a worthwhile cause. Don't miss out, sign up early. We sold out previous years! The Holiday catalog starts Sept. 1st! You'll find a wonderful selection of Fall, Halloween and Christmas holiday stamps, ink, paper and amazing accessories in this catalog! If you are one of my regular customers, your catalog is already on the way to you, watch your mailbox this month! If you are not a regular customer and do not have a Stampin' Up! demonstrator, I'd love to send you a catalog, leave a comment on this blog post, or email me at with your mailing address or PM me via my Stamping with Melva FaceBook page. Carols of Christmas Bundle is now available!